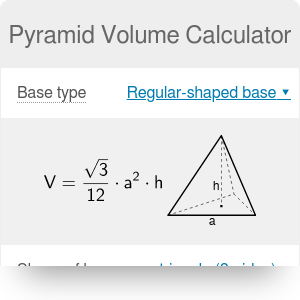 Determine the area of any pyramid-like solid with our pyramid volume calculator. Choose between two options: calculate the volume of a pyramid with a regular base, so you need to have only side, shape and height given, or directly enter the base area and the pyramid height. The calculator doesn't have any problems with determining tetrahedron volume or volume of a square pyramid. If you are still not sure how to use the tool and how to calculate the pyramid volume - keep reading! volume = (1/3) * base_area * height, where height is the height from the base to the apex. Select the base shape. For Cheops pyramid, also called the pyramid of Khufu, it's a square. Of course, it's not an ideal square, but we can assume it is - the difference between the length of the edges is smaller than 1‰. Enter the height of a pyramid. Khufu pyramid height is equal to 146 m (you can change the units to meters with a simple click on the unit. Also you can check out our volume converter). Determine the side length. The Cheops pyramid edge length is on average 230.36 m.
The approximate volume of a square pyramid is equal to 2,582,532 m³. Choose the shape of the base. In our case, it's regular triangle. Type the pyramid's height. Assume that for a tea pyramid it's equal to 1.2 in. Enter the side length. For example, 1.5 in. Tetrahedron volume appears below. For our tea pyramid, it is equal to 0.39 cu in. The height, in this case, can be calculated as: height = a√3 / 6 ~ 0.2887 * a, so if you want to calculate, e.g. the volume of a regular polyhedron with the edge = 3, type 3 * 0.2887 into the pyramid volume calculator "Height" box. Now you are an expert and you know exactly how to calculate the pyramid volume! Why not to check the other volume calculators? Pyramid Volume Calculator can be embedded on your website to enrich the content you wrote and make it easier for your visitors to understand your message.